It truly is a difficult time to operate a newspaper in America. 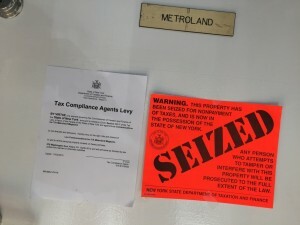 After thirty-seven years of publication, the Albany based Metroland had its doors forcibly closed on November 3rd after its offices were seized by the state Department of Taxation and Finance for over $20,000 in unpaid taxes. Distributed free of charge to approximately forty thousand readers in the Capital Region, the alternative weekly has long been a cultural mecca for its coverage of local arts and the music scene. However, that has done little to prevent the newspaper from falling victim to the financial straits that currently plague the industry. Metroland was put on sale back in July by it's ownership. Despite editor Stephen Leon commenting, "We're not done pursuing our other options," neither the newspaper nor its social media functionaries have made any public statements since the seizure, with not even a single facebook status being published. With the Times-Union's photograph of the paper's closure still in mind, it is yet another dark moment in the continuing death spiral of print journalism.